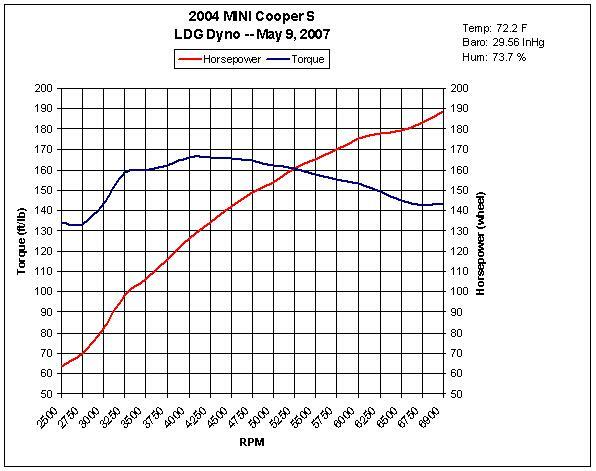 It’s been over seven years since I had John Behe tune the MINI, so I took it back to the Dyno at RPR Performance to see how it’s doing. This car has just bolt-on mods: 15% SC reduction pulley, JCW injectors, cold air intake, and exhaust. We’re currently running MSD wires and coil pack, with Brisk Racing Plugs that are one-step cooler than stock. The intercooler diverter has been modified to try to improve charge cooling. And that’s it. I’ve had the car dyno’d a few times. When I purchased it in 2011 when it was still stock with 48k miles. After the tune I got when the SC reduction pulley was installed a few months later at about 55k miles, and then in October 2018 just to see how it was holding up now that I’m approaching 100k miles. The data is interesting for a couple of reasons. There is a drop in HP above 6000 RPM and it starts to run rich until about 6600 RPM then seems to come back to the expected values. Don’t know if there was something funky with this pull, or if perhaps there’s an air leak on high boost. I plotted the data against previous runs. I had to extrapolate some values since I only had data on 250 RPM intervals, but it’s generally good. The comparison is stock; MTH tune (on my prior MINI); the original tune on this car; and then today. Overall it’s holding up pretty well. I like to use the MTH comparison for people who are thinking about a canned tune. MTH isn’t around any more, but this was an inexpensive tune you could get over the internet. You just told the tuner the mods you had and they sent you back a tune. Pretty good bank for the buck, but you see the real gains in a custom tune when you look at low end torque. 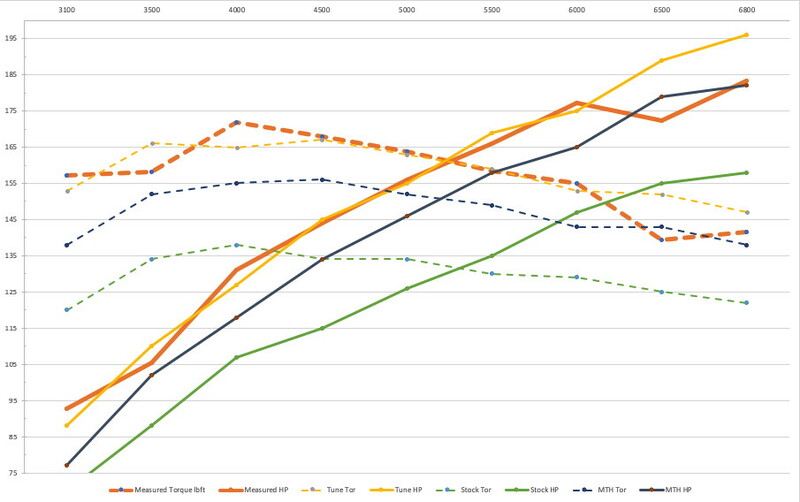 It’s a little hard to read in the chart, but the orange lines are the most recent dyno results (solid line is HP; dashed line is torque). Yellow is the custom tune. Green is stock and blue is MTH. During the off-season I’ll go over the engine and look for the leak. (I can hear it at high RPM.) It’s not throwing any codes so it’s either ahead of the MAP sensor, or after the Cat (or both). It’s about time to replace vacuum hoses anyway. The local BMW club arranged a Dyno day down at York Auto which is just down the street from GeorgeCo world headquarters. Now that the GeorgeCo E30 has a fresh coat of paint, we figured it was time to dial up some power. 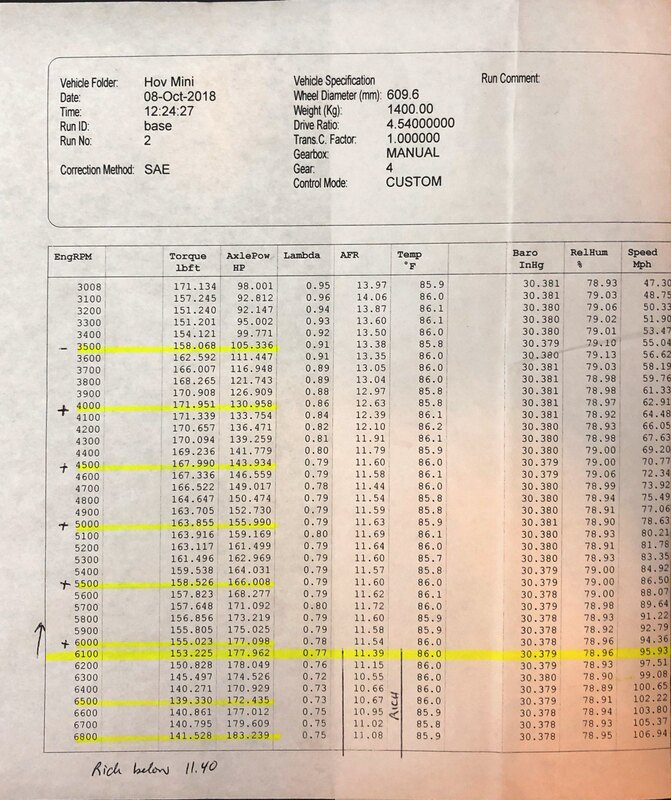 Since good tuning starts with a good baseline, we backed the E30 on to the Dyno and made a couple of pulls to see what we had. The GeorgeCo E30 left the factory in Regensberg 22 years ago with about 170 hp at the crank. Assuming a 15% driveline loss, that should translate into about 144 hp at the wheels. Given that this engine has over 230K miles and very little modification, we were hoping to get 135 hp on the dyno. The only mods are a cold air intake (which really doesn’t help the E30 but looks good); a header; and a “performance” chip from a reputable supplier who shall remain nameless. After a couple of runs to calibrate the Dyno, the results came in at only 125 hp. That’s a 14% loss from new and a bit disappointing. It turns out the air/fuel ratio (AFR) was way out of tolerance. In naturally aspirated engines powered, maximum power is frequently reached at AFRs ranging from 12.5 – 13.3:1 or lambda of 0.850 – 0.901. The AFR runs rich to 5000 RPM then lean to redline. The risk in running too rich is that the combustion chamber is washed by the excess gasoline, effectively cooling the burn (reducing efficiency) but also washing away the lubrication protecting the cylinder walls. As it leans out, it could damage the engine because of pre-detonation. What’s the solution? The WAR Chip by Miller Peformance. WAR stands for Write and Remap. It is an infinitely rewritable chip solution for ECU tuning. It can be tuned from a laptop PC via USB and can store 4 separate tunes that can be switched on the fly without a laptop. We installed the chip following the simple instructions that were included and turned the car over to York Auto to dial in the AFR and put it back on the dyno. Initial results were promising with the preloaded tune from Miller Performance getting up to 135 whp out of the box. Then when we broke the intake rocker on #6 cylinder and put a halt to progress. Since we have to take the timing belt and cam gear off to get to the rocker, it’s going to be a while before the GeorgeCo E30 is back on the track. I went in to Behe Performance for a track-day inspection. I got that, but I also got a couple of surprises — one pleasant and one expensive. I knew my car was leaking oil. You could see it dripping at the drain plug. 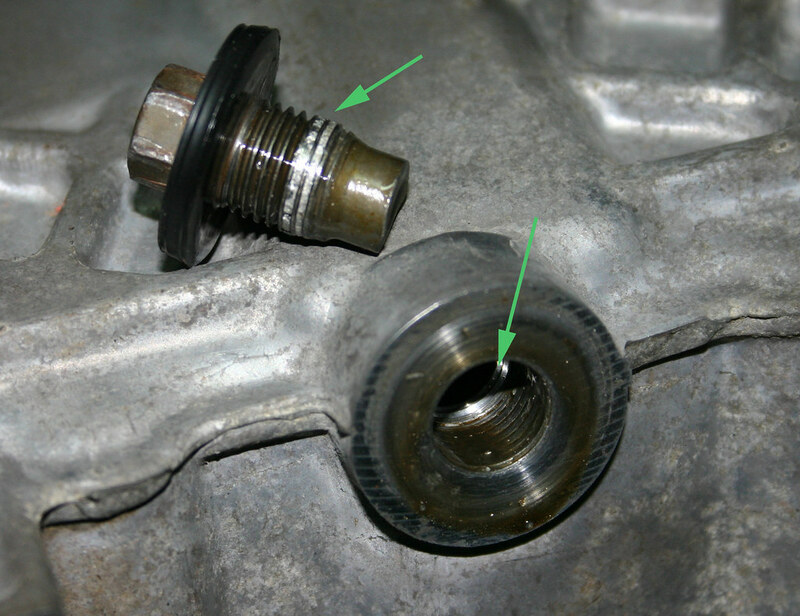 But it turns out the pan seal was going bad and the drain plug was almost stripped. In the photo you can see how two of six threads are already gone. So rather than losing all of my oil on the track at Summit Point this weekend, I went ahead and had the pan replaced. That’s the expensive part. Now the pleasant part. Behe has a new Dynapack dyno. John suggested we should hook my car up to the dyno to see what potential there might be for doing some dyno tuning. From the factory, my car came with 163 horsepower (at the crank) and 155 ft-lb of torque. If you assume a 10% drive-line loss in horsepower, that should translate to about 148 hp at the wheels. I have done the typical bolt-on mods of pulley, intake, exhaust, hotter coil, cooler plugs, and uprated plug wires. On the engine management side, I also have a canned tune from MTH. We were expecting something around 180 to 185 hp. Much to my surprise (and I think John’s as well) it was pulling 188.8 hp at 6900 RPM. Max torque was 165.9 ft-lb at 4250 RPM. Considering those numbers were at the wheels, that’s about 207 hp and 188 ft-lb of torque at the crank. Chart below. Not bad when you consider the cost of those mods adds up to only about $1,500. 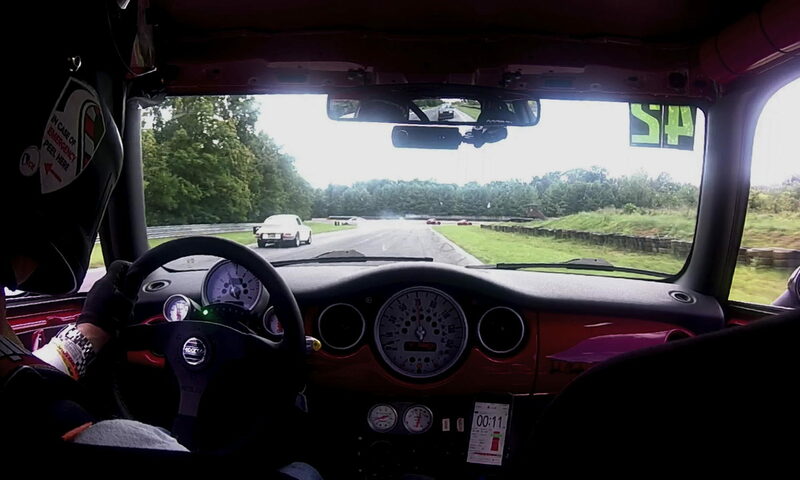 As for DMH, John also had their Cooper S test car which he let me drive. This beast has a re-worked head and cam as well as extensive tuning from John. It’s pulling over 240 hp at the wheels and a max of 190 ft-lb of torque. It revs all the way up to 8,000 RPM. When I was driving it, John kept telling me to stick my foot in it and stop driving like a granny because I was shifting short at 7,200 RPM. It was almost too much power for a street car, but I can only imagine what it must be like on the track. It was quite impressive.